The DJI F450 is designed for hobbyists and people who are looking for the versatility from their quads. This quadcopter is lightweight and flies really well. and a camera. However, these assemblies will be more expensive. Also, this quad can be purchased in RTF (ready-to-fly) mode, with an attached camera. The DJI F450 can be delivered in different ways. However, if you decide to purchase the kit, the package should contain the following: centre plates, APM2.8 flight controller with case, four arms, battery charger, hardware for assembly, 11.1V 2200MAH 30C Li-Po battery, velcro and strap for battery, 3 bags of screws, and wires for the power distribution board. The package does not include any tools. 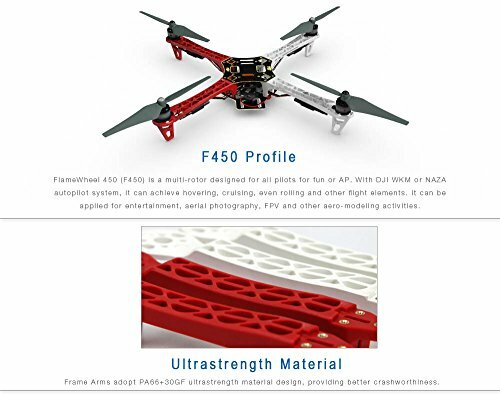 The DJI F450 is very resistant to crashes because its frame id built from ultra-strong materials. 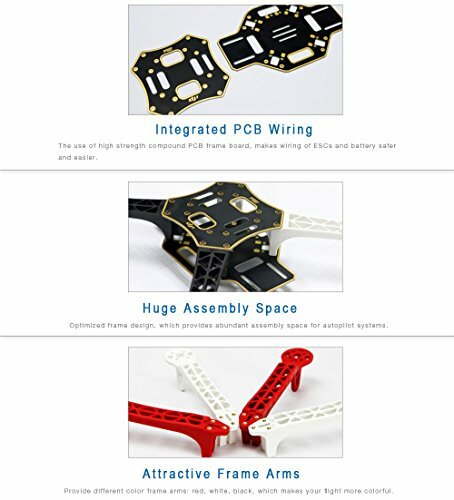 The main frame plates are made from PCB material. This material is designed to implement high-strengths. The arms are made from PA66+30GF material. Normally the kit comes with arms colored differently to offer an improved visual orientation during flight. There are 2 black and 2 white arms or 2 red and 2 white arms. The plates and arms are designed to protect the battery and the ESCs. There is also enough space between bottom and top plates to add elements that need to be protected.
. However, the battery is not included because this is only a kit. Flight time depends on the battery you install on the quadcopter. It also depends on how heavy the quad is after you install the camera. The owner reported a flight time of 18 minutes. The quad was equipped with E300 Motors, ESC and 3S 5000mAh Li-Po battery. It is important to note that the quad wasn’t pushed to the limits. Another owner reported a flight time of 33 minutes. The quad was without any camera and it mostly hovered. 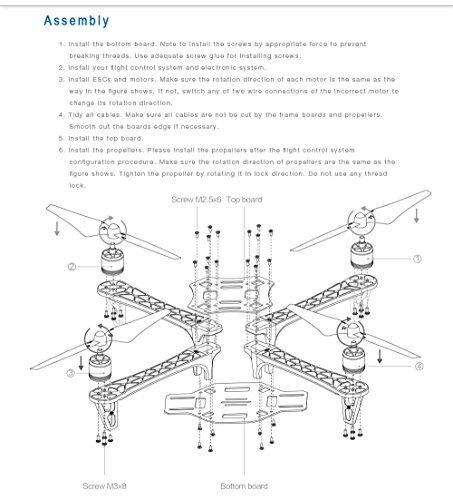 This means that flight time of this quad completely depends on your own settings. This quad also supports an FPV video transmitter. It allows for real-time streaming to a tablet or Smartphone. Again, since this is just a kit, the transmitter is not included. If you want to have a complete experience with the DJI F450 we recommend the NAZAM V2 GPS controller. This flight controller manages to provide better flight performance and it is also preferred because of its incredible features, such as: barometer, inner damping, 3-axis gyroscope and 3-axis accelerometer. Also, the all-in-one design makes the installation pretty easy. Remember that it is very important to make the preparations for its installation in time because this item will be introduced in between the two plates. Because of all these, it knows the altitude. This is why it can be used for automatic controls, such as automatic return to start point. This is possible only if your controller supports failsafe function through port-U and the NAZA controller has a built-in failsafe function. The Return to Home failsafe will be activated when the communication is interrupted with the GPS module in use. It may be difficult to get used to the F450’s flying mode if you don’t have any experience in piloting quads at all. It is very important to get used to the idea of flying a quadcopter. This is the reason why many users suggest trying with a cheaper quad at first. The DJI F450 is very stable in flight and once you learn its moves it is pretty simple to control. This quad is capable of performing a series of stunts, such as rolling and hovering. 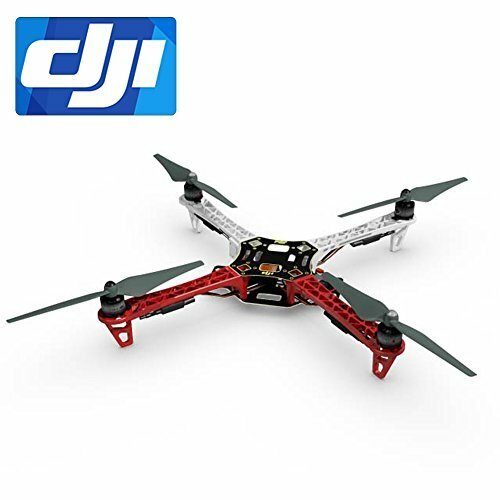 The users report that this quadcopter can achieve the following flight performance – it can support up to 130 kph (80 mph), it has a maximum flight altitude of 466 meters (1528 Ft) and maximum ascent of 390 meters (1277 Ft). Also, it hands off the controller. This is a very interesting failsafe for newbies. This means that the quadcopter is centred automatically by the GPS module when it doesn’t receive commands. The quad simply hovers waiting for further commands. The DJI F450 frame offers a large degree of versatility and that’s why it is considered to be unique. The Arms are designed to make the quad lighter and easier to maintain in the air. Also the plates are durable and shock resistant. Furthermore, you can add a series of elements such as FPV transmitter, a camera of your choice or a landing skids. Other quads don’t allow small parts to be replaced. However, with the F450, each part can be replaced at a very cheap price. These all features make the DJI F450 extremely easy to work with. DJI Flame Wheel F450, Naza V2, H3-2D Gimbal, Storm FPV Solution, Walkera RX701 Receiver, Walkera Devo 7 Transmitter, Storm 5500mAh Battery. 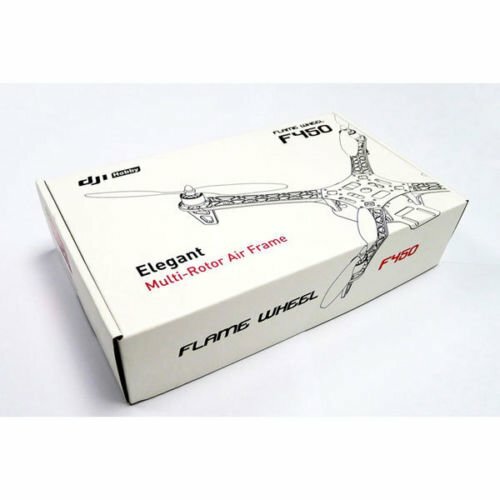 The owner can add different elements to the DJI F450 because it is built as a kit. In this way you can make it as affordable as possible. You will spend about $50 if you only want the kit. However, you will also need a battery, a charger, a radio set (receiver and transmitter) and a controller if you want your F450 to fly. All these elements will add to the price, making your quad get somewhere around $300-$500. There are also more costly accessories available on the market today. These will include landing skids (the original feet are too small), GPS system on the controller, etc. The DJI F450 is designed for hobbyists and people who are looking for the versatility from their quads. This quadcopter is lightweight and flies really well. This allows you to focus on other things such as aerial video instead of worrying about your frame falling apart. The F450 is a pretty advanced quad and it can deploy professional results when it comes to aerial imagery. 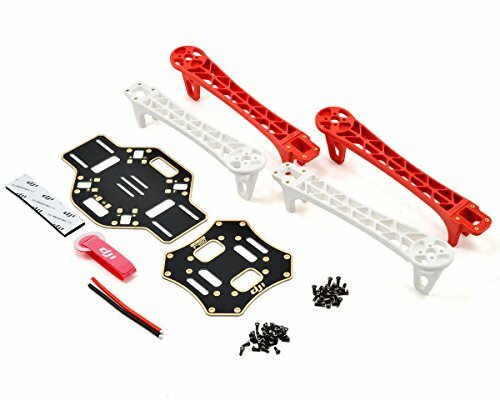 So if you like DIY projects and are a drone enthusiast, this frame will definitely give you the best starting point to an incredible experience. However, you should know that it also requires some technical knowledge and a bit of work.